5-piece but can add female vocals on request. 3x45 minute sets. Recorded music in breaks or live pianist (additional charge). Relaxed, swinging jazz is the hallmark of this highly experienced and professional quintet. Founded in 1987, the group feature Chris on clarinet and alto and baritone saxophones, with a rhythm section of piano, guitar, double bass and drums. 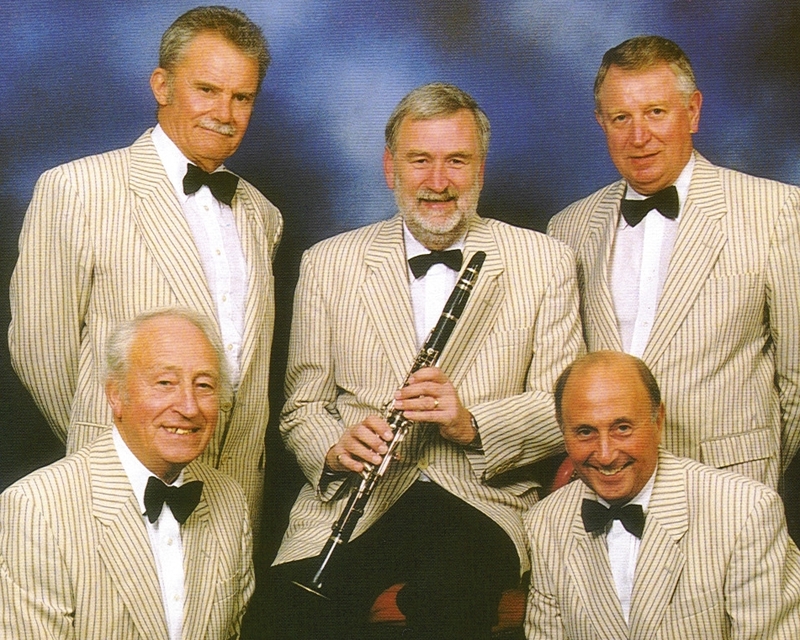 The band have a very wide repertoire from Dixieland classics, through the great swing era tunes of Ellington, Basie, Benny Goodman and Glenn Miller, up to the famous jazz "standards" of the 1950s. Whatever the era, the Swingtet specialise in playing popular melodic tunes that are all time favourites. The range and happy, relaxed sound of the Swingtet’s music makes this an ideal band for parties, weddings and private functions, with an appeal to all ages and tastes. With a noise level that does not inhibit your guests’ conversation, the band can provide background music during a reception or meal, turning to a livelier sound for dancing later on in the evening, although, as Chris likes to make clear, the Swingtet is definitely not a pop group! The band’s professionalism and versatility has made them a favourite at numerous venues including London and country hotels, cruise liners, theatres, as well as jazz festivals, clubs and pubs. And the Swingtet have played at almost any function imaginable including weddings, bar mitzvahs, dances, "ladies’ nights", firework displays and corporate functions. The band have also backed many national and international jazz artists and have recorded several CDs. Our quoted price covers the Swingtet staying at an engagement for around three hours, during which time they would play for about two and a half hours with a couple of 15 minute breaks. As an optional extra, solo piano background music can be provided to extend the live playing time. The band can dress formally or informally to suit the occasion and brings their own professional PA system. The Chris Walker Swingtet are based in Hampshire. See Pricing for details of travel costs, etc. "We all had a superb evening, the band were fantastic, it made such a difference. There is no substitute for live music!" "The act was wonderful, everything we could have wished for, they made the evening." "Fantastic band who were enjoyed by all"
"I was particularly impressed with the personal and highly efficient service offered by function junction, particularly the personalised demo CD we received before we made the booking"
"We thoroughly enjoyed the music. Your efficiency, also, was much appreciated." The band’s repertoire contains well over 1,000 tunes from the classic swing and jazz era of which a small selection is listed below. If you want to request a tune (in the same genre) which isn’t on the list, then the band can usually play it as long as their instrumentation and technique permits.